We want to help make our customers' dreams come true and do everything we can to contribute to society. This is our unchanging identity, and it is who we are. This shapes the actions of all Yokogawa Group employees and ensures outstanding teamwork across all regions and business fields. 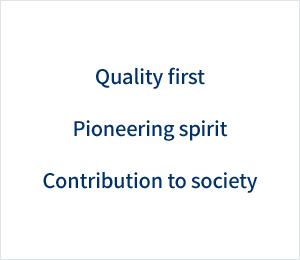 Formulated in 1988, and based on our founding principles, the Yokogawa Philosophy articulates Yokogawa's social mission and sets out the values that guide the actions of Yokogawa's people. Governing our corporate activities, it aims to ensure that we all continue to live up to the ideals of our founders. Yokogawa was founded on September 1, 1915, and started out with just four people. They were eager young minds, and ready to blaze a trail on a totally new frontier ─ the establishment of Japan's measurement industry. Our founder, Tamisuke Yokogawa, exhorted his young colleagues, saying, "You don't need to worry about profits. Just learn and improve our technology. You must make products that earn us the respect of our customers." At Yokogawa, this is still who we are. The core values that shape our corporate culture are exemplified by the priorities and commitments made by our employees. 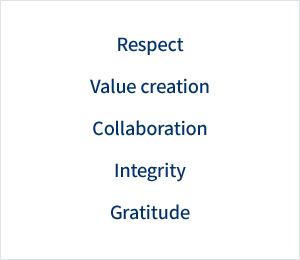 When we live these values, we become a driving force for business excellence and achieve a competitive advantage by engaging in co-innovation with our clients. We aspire to be a globally dynamic and enterprising organization that works toward a brighter future through the co-creation of value with our clients. 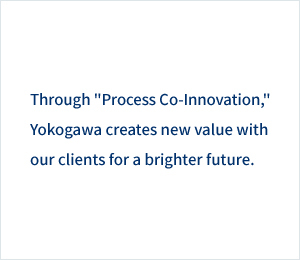 The Yokogawa brand emphasizes our responsibility to our clients. It reflects the trust that we have earned and the satisfaction that we deliver to our clients and partners. The key to building an even stronger Yokogawa is for all of us in the Yokogawa Group to stand for the same things that the Yokogawa brand represents, and realize that our actions each day have an influence on the strength of the bond that we share with our clients and partners. The corporate symbol reflects our values and ideals, and is the emblem for all Yokogawa employees. It symbolizes that we are a dynamic, yet balanced corporation that provides real value. The image is inspired by the sun, which is the main source of energy for all life on earth, and is an affirmation of Yokogawa's commitment to benefit humankind through the development of the industrial sector. Co-innovating conveys our determination to continually engage in the co-creation of value with our clients by working with them in long-term partnerships to develop solutions. tomorrow expresses our resolve to move steadily into the future, one step at a time. We expect that all our staff combine good citizenship with a courageous pioneering spirit and each day bring a spirit of challenge to all those activities in which we engage in fulfilling our roles as citizens of the communities to which we belong. We Shall always conduct our selves as good citizens of the communities of which we are a part by understanding and respecting their cultures and natural environments and in so doing, develop a standard of global conduct. At the same time, each of us individuals and bring to every aspect of our daily activities a spirit of challenge, without the fear of failure. 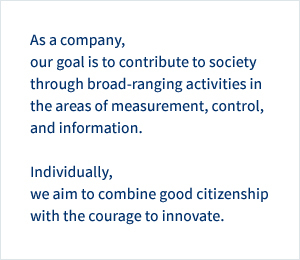 This Company Code imparts the principles of good business for the Yokogawa Group members who aspire to fulfill the Yokogawa Philosophy. "As a group, our goal is to contribute to society through broad-ranging activities in the areas of measurement, control and information. Individually, we aim to combine good citizenship with the courage to innovate." We, as members of the Yokogawa Group, conduct business activities according to the Yokogawa Philosophy and carry out duties with integrity. We observe the Standards of Business Conduct. From the viewpoint of customer satisfaction, we provide valuable products and services that are useful to society. Winning customer satisfaction is the start to gaining the trust of shareholders and all concerned people in the community and society. We observe the laws, regulations, and other rules of society, and conduct business activities with ethical conscience. We accept different cultures and respect the laws and social mores of the international community. We value and respect the dignity of each individual and all basic human rights. We do not develop or foster any relationship with any people or groups that threaten the order and safety of the community and society. We conduct activities with integrity to gain the approval and trust of customers. We provide accurate and ample information to customers so that they can use our products and services in safety and with satisfaction. We use, maintain and enhance corporate assets efficiently and effectively to win the trust of our shareholders. We openly and accurately disclose corporate and management information to our shareholders. We maintain a sound and clear relationship with our shareholders. We strive to achieve the common goals of the community and society, including protection of the global environment and the building of prosperous societies. We endeavor to be a friendly and cooperating member of society and participate positively in the activities of society. We work sincerely and soundly with suppliers and vendors and treat them fairly and equally. We refrain from making any contacts with the suppliers or vendors that may be misinterpreted as abuse of a special relationship, and we maintain sound and open relationships. We compete fairly, openly and freely with other suppliers. We maintain sound and open relationships with politicians, public servants and people related to them. We maintain an active, bright, safe and sound company atmosphere that we can take pride in. We pay careful attention so that none of us would suffer from harassment, unfair treatment, or infringement of privacy. We use the assets of the Yokogawa Group only for Group-related business activities. We fully recognize the value of the knowledge within the Yokogawa Group and that of business partners, and maintain strict records and guardianship of this information. We use information obtained through business activities only for business purposes. We conduct our business activities neither for personal gain nor to take advantages of business positions. Furthermore, we conduct our activities in such a way that the Yokogawa Group suffers no losses or damage. We act responsibly, in private and on business, so as not to impair the Yokogawa Group's credibility or reputation or cause any losses or damage to the Group.